This technology features special bits mounted on the shield machine. These bits directly cut and remove obstacles in the ground (type-III/IV/V steel sheet pile and H-steel) without requiring anyone to get out in front of the face. Bits are replaced by having bit mounts, which are interconnected using a mechanical linkage, supported by a sliding guide and pulling the bits into the machine by applying traction. This permits the replacement of the bits with those for cutting and removing piles or other obstacles and those that are appropriate for the conditions, such as the soil properties. 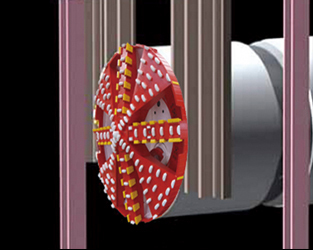 Roller bits that are allocated and interconnected on the spoke are pulled into the replacement room using a slide mechanism, and are replaced safely inside the machine. The replacement room has a double cylindrical structure. Its inner cylinder rotates to permit the replacement of roller bits on all spokes. This system is used when fixed bits are worn out. It makes the retractable bits that are housed in the cutter head protrude to the face using a hydraulic mechanism. This technology makes replacement work unnecessary, although the bits are replaced once only. 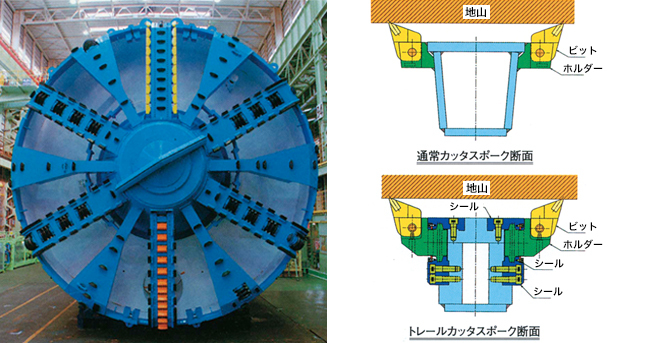 With this method, shield machines are docked under the ground by pressing the built-in steel penetration ring of the thrusting shield into the pressured rubber ring of the accepting shield. The structure permits a large part of the cutter section of the accepting shield to be accepted into the inside of the skin plate. 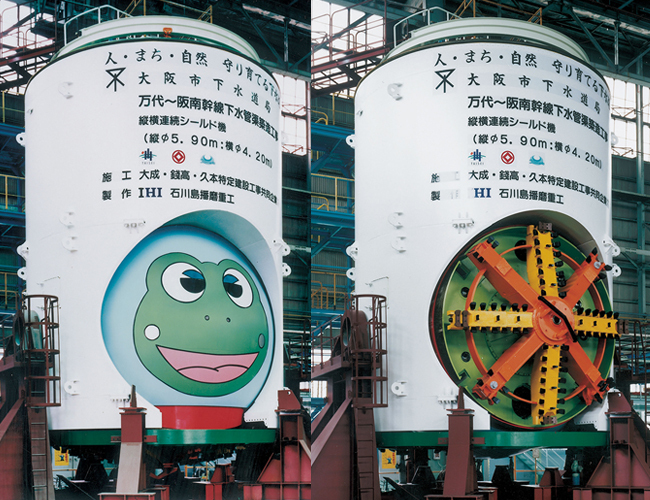 It is inserted into the thrusting shield and a fixation agent is injected into the hood wrap portion, thereby docking the shield machines under the ground. 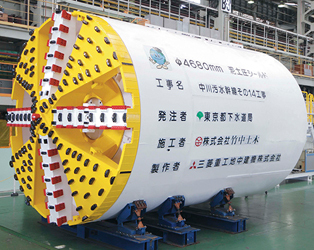 This shield tunneling machine tunnels upwards from an existing tunnel to construct a vertical shaft. It can be collected after reaching the part above the ground and used again. A single machine can be used continuously to excavate a vertical shaft from above the ground, and then a horizontal shaft. 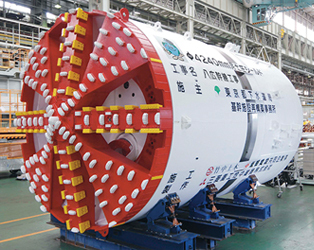 This type of machine also has a function for excavating a vertical shaft with caissons or underground walls, which would be required with conventional methods. This means that the site required for constructing a vertical shaft is smaller than it was in the past.